Today is Tuesday, April 18, the 108th day of 2017 in the Gregorian calendar, with 257 days remaining. Today is the deadline for filing Federal and most state and local income tax returns for 2016. It is also the last day of Passover. 1,373 days until the end of Donald Trump's term as President, assuming he doesn't resign or is impeached. 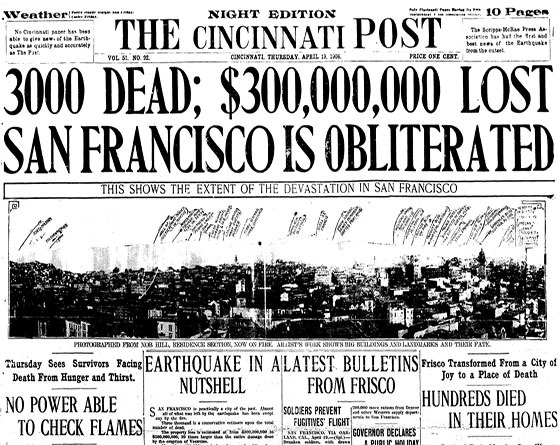 On this day in 1906, a major earthquake struck San Francisco and set off raging fires. More than 3,000 people died and 80 percent of the city was destroyed. Florida man accused of breaking into woman's home to fry chicken. "You can do anything you want in life. Unless Jay Leno wants to do it too." From your heart, through your circulatory system, to your leg muscles and kidneys, running a marathon is sort of like putting your entire body through a meat grinder. For example, 82 percent of runners showed stage 1 acute kidney injury immediately after a marathon. First world problem of the day: Crest has a terrible leaking-toothpaste problem. Scientists find giant, elusive clam known as 'the unicorn of mollusks'. A unicorn that tunnels into underwater piers and pilings and is a major cause of damage and destruction to submarine timber structures and the hulls of wooden boats. Trump has spent one out of every five minutes of his presidency in Palm Beach. Mental illness is on the rise but access to care keeps dwindling. The uninsured and a lack of mental health professionals is exacerbating the siutation. Viral story about 'married couple who found out they were twins through IVF' appears to be fake. A prior story claimed to take place in Denver, but the next iteration moved it to Mississippi.